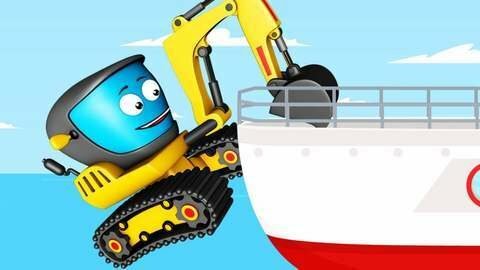 Watch the mad Monster Truck as it chases after the Crane And Excavator in this car cartoon for kids because it got hit with a ball that the Excavator found while digging. As the two vehicles try to escape the Monster Truck, they jump into a ship and got help from the Bulldozer. Unfortunately, they are not yet completely safe because the ship got hit with an iceberg and is now starting to sink. Watch more car cartoons that will entertain your kids for hours by going to Kivitu.com.